I’m just back from my first ever camping trip and first ever family music festival, so being addicted to lists I thought I would share and share alike! (b) I’m retentive about lists. I’ve highlighted the MUST HAVEs for you! If you haven’t been to a festival with the kids yet, check out my post on why family festivals are a great adventure to try out with the kids and my review of the fabulously muddy Penn Festival and last years Just So. Check out my tips on what to wear to a festival, plus my Pinterest board with more ideas and links to the clothes. Hotwater bottles for me and the kids – OMG so glad I had these as I’m a wimp! Pillows for me – yep wimp again. Those cuddly teddy bear pillow for the kids – make great teddies and travel companions too. Rucksacks – for each of us, don’t use over the shoulder bags, and if you can get oilcloth washables one for you, they will be the easiest to clean afterwards. Power monkey to charge up iPads and iPhones – AMAZING! Here’s my pinterest board for camping/glamping stuff. Bunting and solar fairy lights – 2 lots – VERY important! Mallet – for the tent. Pop up tent – we have a little one that is useful sometimes for at the festival or keeping things in outside our tent if we don’t take an awning. Pink whistling kettle – obviously! Enamel Tea Pot – Keep Calm and drink tea from John Lewis – tea is obviously a necessity! Enamel Plates and Bowels – pretty ones with bunting on from John Lewis – I was disappointed that the edges seem a little dodgy. You can buy the blue ones from the pound shops. Cuttlery – we had plastic, but it was horrid. Cooking spoon – get a metal one, we melted the plastic one! Saucepan and frying pan – doesn’t need to be big, just enough for a whole meal for the family. Picnic basket and cool box – we didn’t really use this as we decided not to take lunch with us, but we will use it at the Just So festival and our holiday in Siblu (french caravan park). Cooker with 2 hobs and under toaster (plus canister) – great for tea, a full english breakfast and making dinner on the night we arrived. Collapsible washing up bowl – so useful for feet, washing up and catching drips from wet clothes! Light cutting mats for cutting up things to cook on. Tea towel – we forgot! Dustpan and brush – definitely needed on longer trip. Kitchen cooker table – was very wobbly, I wasn’t sure that it would stay straight. Not needed for a festival (just cook on the ground), but good for a longer trip as long as you buy boxes to store stuff underneath. Table and Chairs – This one from Cotswold is very easy to transport, but a little wobbly with little kids and takes up lots of room. I don’t think you need it for a festival, just for camping longer than a weekend. Cheap Plastic backed picnic blanket – was a god send outside the front door. EAR PLUGS – (Reminded by a lovely commenter!) – I use the blue waxy ones from Boots, not the yellow foam ones or the plastic ones. Eye masks – you know the ones you get on a plane – can be useful because it gets so light in a tent in the mornings! Travel bottles with shampoo and conditioner. (I can’t travel without mousse either). Tampons and pads – if there is a chance your period is going to come while you are away, you so know it will! Note: Remember not to take glass bottles to a camp site or festival. Alcohol – now at the penn festival you couldn’t take alcohol on site, so the best bet would have been cans of cider or gin in a tin. But at Just So last year we spent some time at the tent in the evening, so a box of wine is a good plan. (Be considerate if you get drunk please!). Fruit – last year I felt a bit unwell after going to Just So because my body is fussy and likes it’s fruit and veg. So definitely take grapes, apples, satsumas, those innocent fruit drinks for the kids, and some extra veg for the adults for the first night’s dinner. Snacks – will be expensive so add some high sugar but healthy emergency rations: bear fruit, yogurt covered raisins/strawberry flakes, sesame seed snaps etc. Plus late at night the kids might be snackish, so some crackers are a good idea. Cereal – those little travel boxes of cereal are great if you aren’t taking bowls. But they caused arguments between the kids as they don’t have equal numbers of types of cereal. So I’m going to pick one type and put in a plastic box next time. Eggs, Bacon, Sausages, Tomatoes – we had a full english breakfast because the Penn Festival didn’t start until 12, so didn’t need to take a picnic lunch with us. Whereas the Just So festival starts really early, so there will be no time for this. Baps, cheese, crisps – when we go to Just So it starts earlier so we will take lunch with us. Dinner – on the evening of arrival and last night – but don’t bother during the festival. 2 cold cooked chicken breasts chopped up added to fresh pasta (quicker to cook). Add pesto and a big tin of sweetcorn. I was tempted to introduce the kids to spam and corned beef! Remember you can get tinned potatoes, which would be quicker to cook than normal ones. What do you think of my tips and list? Let me know if you use it and if there’s anything to add. Also feel free to add your own lists in the comments! This is an amazing list! We camp regularly but have never been to a festival. The one thing I always forget (which I won’t this weekend now I’ve wrote it here!) is cooking oil for the fry-up. We usually end up trying to dry fry bacon! Good point Emma! Don’t think we took oil – we must have used the butter? Oh My goodness. Just as @mummyratesit was starting to convince me – that’s put me right off! Haven’t you forgotten the kitchen sink? LOL Hope you have a marvellous, splendifidous time! Nooooo don’t let it put you off Anya – I had a lovely time! We always seem to forget oil too! Box of wine! Great idea. I’m storing this in my inbox so I don’t have to think about packing when we go! Great list! (I have one on my blog too) I was pleased to see we share a love of bunting and solar lights. We have a dragon on a pole too;) , and this year we have Shmangles! A bit of a delayed comment (busy week!) but great list and lots of nice touches like teapot (though the packing police might put a stop to that – husband a bit of a stickler!) , power monkey and hair turban! Few small additions from me – rubber flip flops for the showers – can be a bit grim going barefoot in those. Dry shampoo. We don’t take hot water bottles anymore but instead have those fleecy all in one sleepsuits (annoyingly have to grab them in winter as really hard to find in summer) for the kids & fleecy socks, then tend to be snug as bugs in those and also good in the morning when if they wake early and it’s still cool. Finally, those little instant porridge pots which you just add either hot milk/water too. Saves on washing up the pan and again warm on a cool morning. Enjoy the next one! We might be at Just So (just waiting to see if might be singing there) so will tweet if we are! Great list! We’re going to a festival this weekend and can’t decide on whether to take the cool box – I see you’ve got meat on your list – don’t you find the ice packs warm up in about 24 hours? Or do you only eat meat on the first day? MumToThreePrincesses what I do is take a frozen orange juice, frozen apple juice and frozen milk (as well as unfrozen) – so they add as extra cooling. But I don’t eat meat on the 3rd night, maybe not even the 2nd. The weird thing was that the first camping trip everything stayed frozen and on the second one it ws only cool. No idea why, but I suspect someone not zipping up a list. I’m so glad you like the tips @MichaelSilver, there will definitely be more tips coming up soon – I’m trying out a motorhome this Easter (too cold for a tent, brrrrr!). I remembered this list from last year, so am using it as the basis for my packing tonight. Thanks Lisa! Brilliant! 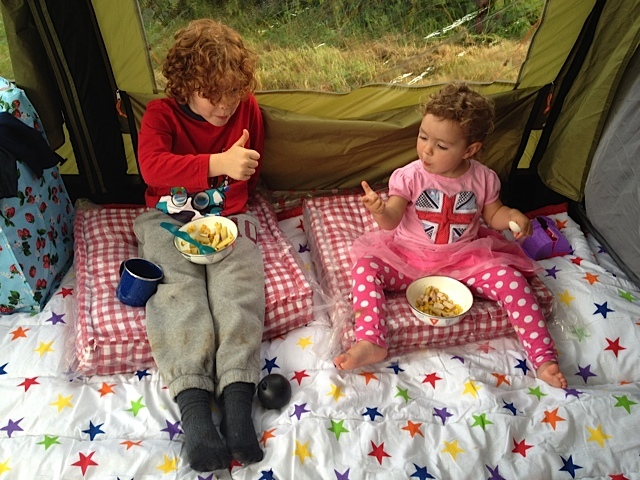 We’re off to Deer Shed Festival so I found you via a search for what to pack when taking kids to a festival. I am now addicted to your blog. Oh so glad you enjoy my blog @Linz, hope you have fun at Deer Shed!